Beginning in Lincoln Heights and snaking 17 miles to Irwindale, Huntington Drive served as one of the only thoroughfares from downtown L.A. to Pasadena in the early 1900s. Its namesake, Henry Huntington, built a regional trolley system nearly a century before Metro’s vision became a gleam in some bureaucrat’s eye. And everywhere the Red Car went, development was sure to follow. One of those lines ran along a portion of Huntington’s median. 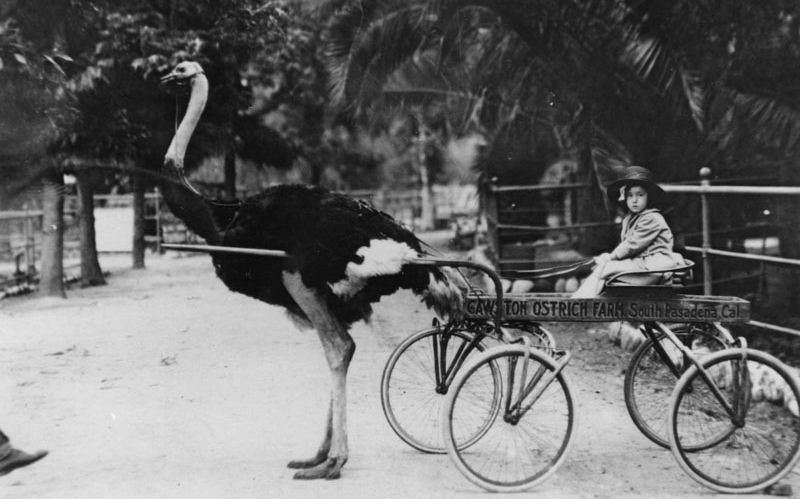 If you rode east far enough in the 1930s, you’d pass the Cawston Ostrich Farm in South Pasadena, the railway magnate’s old residence (now the Huntington Library) in San Marino, the brand-new Santa Anita racetrack in Arcadia, and the McDonald brothers’ Golden Arches prototype in Monrovia. You’d also be traveling on what would for a while become a stretch of Route 66. After the trolley stopped running in 1951, the tracks made way for the massive median lawn you see today in El Sereno and San Marino. Previous article“Salt Bae” Is Bringing His Internet Meme Meat Empire to L.A.